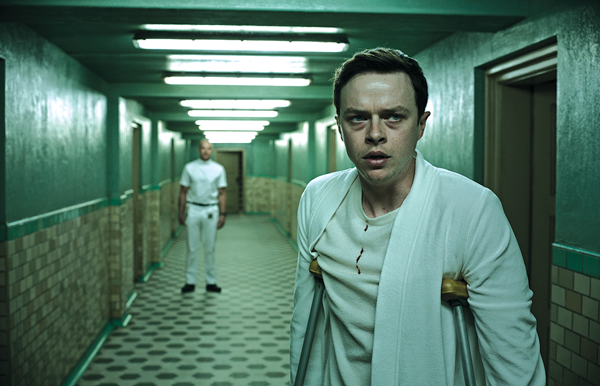 Dane DeHaan plays Lockhart, who is trapped in the eponymous wellness center. Photos courtesy of 20th Century Fox. Director Gore Verbinski, whose most popular works include “Rango” and the first three “Pirates of the Caribbean” movies, churns out the 146-minute mismanaged journey of Lockhart, played by Dane DeHaan, who travels to a mysterious wellness center in the Swiss Alps to retrieve his company CEO, Mr. Pembroke (Harry Groener). Pembroke writes that the wellness center has relieved him of the psychological sicknesses of the modern world, but when Lockhart arrives, he quickly realizes that there’s more going on than water therapy for old people. Mia Goth plays the mysterious Hannah, who is the youngest patient at the wellness center. Photo courtesy of 20th Century Fox. The movie has several things going for it, especially early on. Visually, the cinematography is top-tier, sometimes breathtaking in its execution. The pale color palette of the first act reflects the soulless grind of the corporate world, and a tightly crafted monologue shapes Pembroke’s urge for escape. When we arrive at the beautiful Swiss castle that makes up the wellness center, we are met with a sea of eerie colors that paint an otherworldly tone alongside more displays of magnificent cinematography. Then, unfortunately, the rest of the plot kicks into gear. The dialogue in this film seems like it was written by a sixth-grader. The characters don’t behave like humans but instead say or do anything they can to painfully explain the plot to the audience. Even with the shameless over-explanation, I still don’t know what the movie was trying to tell me. Verbinski and screenwriter Justin Haythe quickly forget the anti-corporate theme that was sparked in the beginning. The filmmakers breeze through themes of youth and innocence, genetic superiority and social class but take no effort to flesh them out. Let me remind you that this movie is more than two hours long. In all that time, we don’t get any substance because Verbinski forces us through half-baked, reoccurring symbolism, shock-value scenes for the sake of keeping the audience awake and tragic flashbacks that add nothing to DeHaan’s character (whose name I’ve already forgotten). Unfortunately, it’s wasted on a film that fails to deliver its ambitious intentions.